This recipe was easy peasy, and does not require a stand mixer. Just blend the peanut butter and softened butter together with an electric mixer, add the sugars, then eggs, followed by the dry ingredients. Then chopped peanuts and chocolate chips get mixed in at the very end. These blondies were very good, but definitely not as peanut buttery as I expected them to be (given their name). Even my husband tasted one and liked it because "it doesn't taste too much like peanut butter." Don't get me wrong - I do think the peanut butter flavor is prominent (not sure why my husband couldn't taste it). The peanut butter just isn't over the top like the name implies. I think these are "peanuttiest" because they have both peanut butter and peanuts in the dough (especially when you use the crunch peanut butter variety). Nicole probably described these best - they are like thick peanut butter chocolate chip cookie bars. They are incredibly soft and moist, too (even though I think I overbaked them by a minute or two). Thanks Nicole, for hosting this week. I can definitely see myself making these again. If you would like the recipe, you can find it here. Make sure you check out the TWD Blogroll, to see how everyone else enjoyed these peanut-y treats! Last but not least, congrats to AD of A Path in the Moonlight (comment #16) - you're the winner of my recent giveaway. I hope the soon-to-be mom/dad enjoys the gift basket! - I used honey roasted peanuts instead of regular salted peanuts. - I did not put my pan on a baking sheet as directed in the recipe. 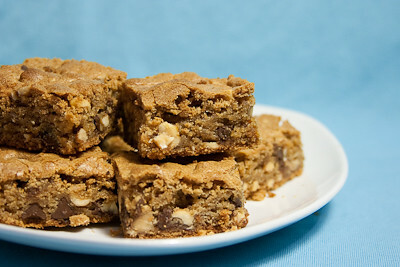 - I took my blondies out at 38 minutes (and they were probably done around 36 minutes), so (as with any recipe) do keep an eye on them while you are baking these. You baked the hell out of these girl (hehe). They look amazing! I see you used honey roasted peanuts.....I think they really add to a dessert when plain peanuts are called for in a recipe. Hope you and your sweet girl had a lovely Halloween! Ok, after reading your post, I think I definitely messed up. Wondering if I should have just used a little hand mixer. I must have whipped some air into them because they rose up and fell. Not soft like you describe. Sounds like I should have added the peanuts too. Yours certainly look good. I think this is my most favorite post ever! I love peanut butter! Oh, and the whole winning thing :) YAY! I love the flaky crust you got on yours! Thanks for baking along with me! Yum! I didn't think they were very peanutty, either. But still great! Well, I think they ARE more peanutty than peanut buttery. They look great. I would try these again and bake less time as well. Katrina - good point! I never really thought about making that distinction :) the name totally makes more sense now. After reading your post I have to give these a try. i can totally see myself going nuts (no pun intended) with these! 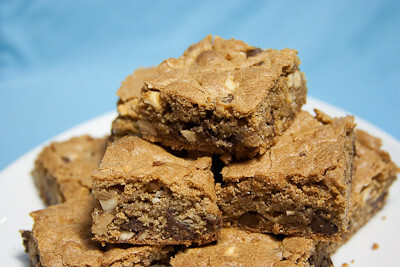 Peanut blondies would be the best right now! They look so moist. Thanks for sharing!